The Heriz district in NW Persia is justly famous for its robust, resilient semi-geometric rugs with charming designs and crisp natural dyes. 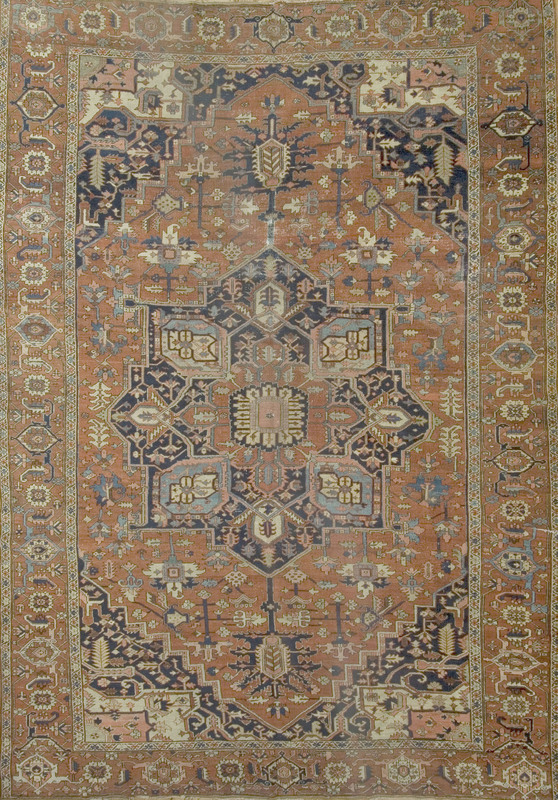 Medallion carpets constitute the majority of the production. 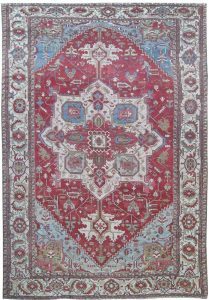 Serapi rugs are a particularly high quality grade of Heriz and there is no village of that name. Although the name derives from Serab-i, from Serab, they do not share any characteristics with Serab rugs. Heriz carpets are the most popular of all antique Persian carpets and have never gone out of style. 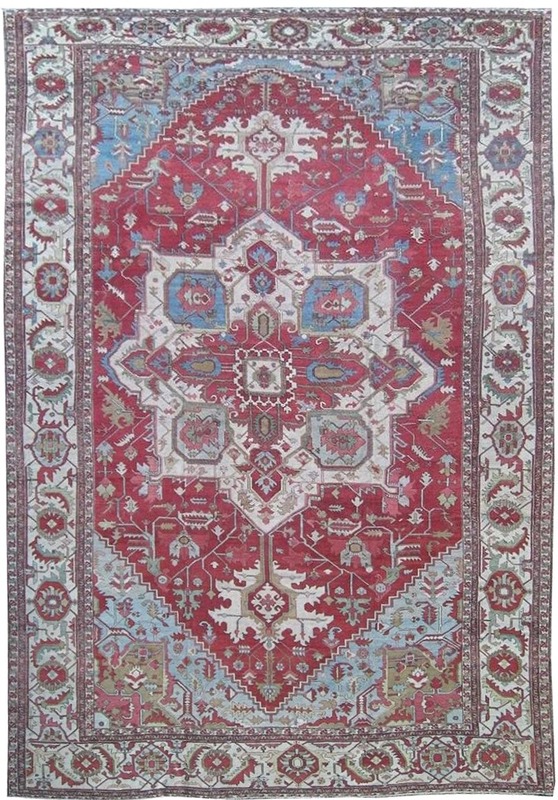 Serapi carpets are all antique and were woven between 1890 and 1910. Heriz carpets combine the geometric styles of Caucasian rugs from across the Aras river with urban, usually Tabriz, medallion formats. All Heriz rugs are woven in small family workshops by the local women. The vibrant and appealing natural dye palettes are wide and the wool is locally sourced. The vivid colors mellow with age to give a desirable variegation or “abrash”. Heriz carpets, whether antique or vintage, are visually vital and artistically decisive. The term “Serapi” (or “Sarapi”) first appeared in American auction catalogues in the 1920’s.The origin of the term is obscure, but there are several possibilities. It may be a corruption of “Sarab”, the camel border runners and long rugs from Sarab town, at the southeast corner of the Heriz district in NW Persian Azerbaijan. A more fanciful derivation is from Saltillo Sarapes, the blankets of 19th century Mexico which have vaguely similar central medallions. There is no village of Serapi and the term is probably a carpet trade confection. The proximity of the Caucasus to the north accounts for the stylized, geometric drawing of both major and minor elements. 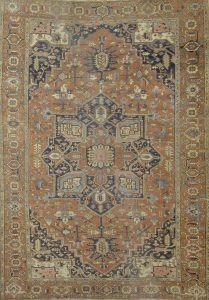 It is a general grade of Heriz carpets. Some have depressed warps, short and erect pile and leathery textures. Others are single wefted with flat backs, pliable handles, and more recumbent piles. Regardless of weave type, the excellent dyes are all of natural origin. There are no Serapi’s before 1890 or 1895 and none postdate 1920. In all likelihood, these ever-attractive carpets were all made for the local Tabriz carpet traders working against orders from Western importers. Very few Serapi’s went to the domestic market and any now in the local Persian trade are re-imports from the West.